Make your clan, hunt together, make cheetah family and survive inthe wilderness of the savanna forest. This tiger survival game isall about to explore the Jungle and look for hunting to feast on.You are a vicious and angry tiger leading a tiger family sim 3d andclan of arctic tigers and looking to kill anyone who comes in yourview. Play this tiger family simulator or clan of tiger game andfight with wild animals like cheetah, hyena, buffalo, leopard, lionand other dangerous animals in the huge jungle wilderness. Tigersimulator games 3d and tiger fighting games were never been sothrilling. Beat the bosses of jungle in this wild tiger foresthunt. Play like a hungry beast animal that searches for its preywith the help of mate or clan in this tiger family simulator game.Play as a Tiger survival wild escape hunt to attack and kill forfood in jungle with Tiger Family Sim. Experience the real tiger’slife with tiger jungle hunt. Fight with jungle beasts with the helpof your clan to survive in an adventures jungle environment. WildAfrican tiger is a Combination of adventures, simulation andrampage around the massive Jungle in wild tiger jungle hunt. Bewareof giant crocodiles and elephant they might attack furiously you aswell so you have to be ferocious to eager attack on them in wildtiger simulator jungle survival. Wild life tiger game is speciallydesigned for the lovers of tiger fighting games and tiger attackgames with our tiger family sim 3d. Start the wild tiger adventureand survive in the wilderness to dominate the jungle wildlife.Start your jungle hunt in the lush green forest with the help ofclan of white tigers. Show your ferocious nature as you are king inthe wilderness of huge jungle. Features in Tiger Family Simulator ✪Explore the big savanna jungle & create cheetah family. ✪ Findyour mate, feed & protect her in the wilderness of forest. ✪Make your clan of the tigers, fight & hunt together for hunger.✪ Attack & running tiger family simulation with HD graphics intiger simulator 2018. ✪ Realistic safari 3D landscape with dynamicweather conditions. Start the wild tiger hunting adventures andfeed your ultimate tiger like a sabertooth tiger play this wildtiger simulation game and show your strength, attack and survivalpower in the wilderness of jungle. Download now Tiger Family Simthe vertex of tiger attack games and tiger games 3d new free topfighting animal. 301 Shayan Center, G.T. Road Lalamusa. Get ready to slay your victim, look for your preys, slither aroundand kill them in the most pitiless way possible. Beware all, herecomes the scariest giant predator in town from the jungles ofAmazon and it’s looking for food.Play deadly anaconda! The GreatSnake is always hungry.The spot is filled with all kinds of wildanimals to target: hunt the Powerful King Lion, the Delicious Deer,innocent hen , rabbit , goat ,the Mighty Wolf and even fight withhumans. Prove with your might that you’re the ultimate villain ofthis jungle in Angry Anaconda Snake Simulator: RPG Action Game.ANACONDA POWER Utilize your stealth and cleverness to carefullycalculate the right time to Hunt.From the jungles of the Amazoncomes one of the most feared animals on the planet - the Anaconda.This guy is looking for his next meal. But you can be sure, it wontbe you. This game puts you in control of this deadly beast.Risefrom the water and look for your next snack. This snake is ready toattack anything in his way. Cars, people, skaters, gas tanks,trucks, and anything else he wants. The snake that goes hunting foranything. This includes horses and crocodiles. COMPLETE ACTION PACKIncludes action packed maps and unique missions to complete. Racearound the map and complete the mission before time runs out.Anaconda simulator comes with all the features your expect from afun 3D game.Suddenly, you’re a lethal Anaconda looking to slay yourvictims in the most merciless way imaginable.Attack from behind;coil around and CRUSH your foes with force! Wild Anaconda SnakeAttack Sim takes you on pitiless giant anaconda life’s journey,slay your victim with super strength and powerful hunting skills.FIGHT WITH ANIMALS in RPG Simulation Game: Born as deadly killeryour task is to crush and attack crazy carnivore animals like fox,polar bear, wolf pack, lion, cheetah and panther. Use your razorsharp poisonous fangs, coil and force for brutal attack on deer,gorilla, elephant, hippo or hunter. Target anyone comes in your wayenjoy life like high definition graphics with superb attacking andfighting animations. SNAKE vs SNAKE Just select your favorite giantsnake and fight with other snakes to complete unique missions.youwill enjoy taking control of this huge 3D Snake Attack againstother anaconda , cobra , mamba , rattler , king snake and python.Angry Anaconda Snake Simulator: RPG Action Game FEATURES: ✓Exciting 3D Maps to Explore ✓ Realistic swamp night mode with RPGgame. ✓ Simple and smooth controls to help chase your prey ✓ EasyControl Gameplay ✓ Realistic 3D Anaconda Snake ✓ Animal Simulationat its best ✓ Various lifelike anaconda breeds Download now to seehow many people you can catch. His survival depends on you. Thesnake was only running in forests and jungles for years, but now itis ready to run on your smartphone! Attack other animals andcritters like elephant, hippo, zebra and more to make them yourmeal. Beware of hunter while you attack, he can kill you with hisweapons. Be swift while attacking the hunter. After the great achievement of Transport Truck: Zoo and FarmAnimals game, here we are with an addition to sea animal truckgames with sea animals cargo truck. It is going to be an ace amongthe animal transport games having the original concept of animaltransporter truck 3D with the rousing sea animal transport truckermissions. Start your euro sea animals transporter truck & addtwist to the animal transport games, become an expert animaltransporter truck driver. Sea animals cargo transporter games werenever been so amazing! Animal truck games lovers will surely lovethis transport truck sea animal cargo trucker game and this is oneof the premium animal transport simulator that is going to be fullof adventure for the sea animal games lovers with 3D transporttrailer truck parking simulator. So get ready for the TransportTruck Sea Animals which is all about the Sea animals transportationon sea animal cargo truck concept. In 3D sea animal big truckdriving game, you have a chance to act as animal transport trailertruck driver with the best sea wild animals truck. There are numberof wild animals that you have to transport to the destination tocomplete the game such as whale ,blue shark,rissole dolphin,squid,moray eel,sea bream,sperm white whale,long finned,pilotwhale,common dolphin, Beiderbecke etc. With sea animal cargo truckand twist of sea animals transporter truck drive, first of all youneed to load wild animals killer big whales and water animals inthe aquarium placed on the trailer of the 3D truck and then youhave to transport and deliver them safe to the destination.Similarly you will take the water animals from the seaport and laketo the aquarium house by your mega truck transporter. While movinganimals, you must transport them in a way that won’t cause theminjury or needless suffering.You will move this heavy duty animalcarriage truck to its target with precision and accuracy. Besidesyou’ll enjoy more interesting levels in this animal transport truckgame. So get your hands on the animal cargo truck transporter andbe the king in the big seaport of this heavy truck simulator. Dareyourself to become a driver of this huge animal truck transporter.Surely! You have not played such type of animal sea animaltransport games as yet. So revive the uniqueness in animal trailertruck games blended with the concept of 3D trailer animaltransporter truck games. It's your time to display some courage andresponsibility required to operate this heavy loaded truck withwild water animals. So take it now and enjoy the drive of TransportTruck Sea Animals which is best sea animals cargo truck simulatorin 3D. Let’s complete one of the best animal transporter gameswhile controlling through animal transport simulator. This is thebest of truck trailer transport games for sure while keeping yourmain focus on transporting the animals. Our Transport Truck SeaAnimals brings everything that a dedicated transporter 3D Simulatorcould wish for with cargo truck free. Features: - Choose yourfavorite euro truck with huge aquarium. - Load & cargo seaanimals on your transporter truck. - Drive your euro super truckcarefully around the city. - Amazing driving experience of oceanlife transportation. - Superb 3D graphics & cargo truck seaanimals transporter experience. Download and Enjoy an amazing addition to big truck transportergames, the top most of all transport truck and cargo truck games.We assure, truck transporter games 3D simulator not once gave yousuch a mega cargo truck experience of driving heavy truck withtrailer transport with the heavy load. 3D transport truck is one ofthe dream transporter games for the lovers of heavy excavatorsimulator and crane truck games who like tractor driving, tractorparking and driving other construction machines. So get ready for awonderful HEAVY Machine TRANSPORTER TRUCK fun driving game whereyou can show off your parking, driving and heavy equipmenttransportation skills.The game is about heavy machinery and heavyequipment transporter, a new kind of cargo heavy truck trailertransport game to load, deliver, and unload large machineryconstruction vehicles like dumper truck, crane, excavator bulldozerand shovel on top of your truck transporter loader. check out!You’re about to drive the huge automobile transporter lorry and itcontains the most expensive construction vehicles. In thisextremely fun driving and parking mania game you will be given withsome heavyweight building machines and your core assignment is todeliver building equipment from factory to the construction area inthe city. Drive and load all heavy duty vehicles carefully andmaneuver them on the trailer so they fit in perfectly within theindicated spot. Then drive the massive trucker to the destinationby following arrow while managing the huge load with precision andaccuracy. Do your job carefully. You have time limit in each level.Try to be the best truck driver in the city, become a realtrucker!Features:• Real experience of driving heavy cranetransporter 3D.• Realistic city environment exploration with trucksimulator 3D mania.• One of the best real transport games 3D.• 10exciting levels of big transporter driving.• Smooth steering,brakes, lifting, turning and truck pull controls.• Astonishing 3Dgraphics for the feel of heavy truck trailer transport.• Accuratephysical simulation for truck driving and vehicle parking.So timeto enjoy the large jumbo transport truck with heavy equipmenttransporter simulation which gives you the excitement of cargotrucker blended with the fun of transporter games. If you loveplaying 3D truck transporter games and like heavy excavator thenthe game is made for you. Cargo truck trailers games never featuredlike this heavy truck trailer transport game. Play the HEAVYMACHINERY TRANSPORTER TRUCK, the trailer truck to transport jumboequipment! Wild Tiger vs dinosaur adventure is here! Enjoy the astoundingjungle animal simulator with action packed missions of animalfighting. Tiger simulator gameplay; fight against the superdinosaur and tear down the giant tyrannosaurus. Angry tiger clawstrike can hunt down dangerous wild animals in one strike. WildDino gameplay: do wild tiger hunting with your deadly sharp teeth.Powerful dinosaur can kill the jungle king – Tiger, and rule hiskingdom. Now switch the sides and play as wild lion defending itskingship from the violent tyrannosaurus Dino. Save jungle life fromdinosaur war against wild animals and kill them all in this brutaljungle chaos.In wild jungle adventure, kill aggressive animals andkeep hunting and dinosaurs. The face-off of beasts is awesome.Playing as t-rex dino, your end target is to challenge the clan ofangry tiger and if you are playing the wild tiger rampage, you needto go head to head versus trex dinosaur. War is on fire, defendforestry against dino attack, monstrous spinosaurus twin and takeback your territory. Enjoy the action packed tiger attack simulatorgame with jurassic dino hunt missions. Hunt enemy dinosaur anddominate the landscape. In wild dinosaur hunting simulator, chasethe tiger in rainforest and kill wildlife super bosses of Africanforests. Stay alert and focused the forest tiger revenge is on andit chase & hunt them in super dino adventure game. Control thebeast in its fits of fury and help it survive by chasing,attacking, fighting and eating wildlife safari tiger. Counterattack the wild lion attack and smash the ferocious creature underyour heavy feet. Exhibit prehistoric dinosaur power through furioustiger killing and hunting. Both the animals are very angry and willnot hold back. It will attack any wild animal that comes in itsway. Create strategies for tiger attack dinosaur and how to surviveagainst dinosaur attack with higher levels than yours in order tosurvive as jungle tiger survival is the only challenge. Make sureto rest before challenging, fighting and attacking deadly dinosaurcreatures. One Real Dino attack can kick out the jungle king, soplay smartly against the giant dinosaurs and finish it with a sharpclaw attack of angry lion. Tiger vs Dinosaur Adventure 3Dfeatures:★ Real Tiger vs Dinosaur Survival Missions★ Angry dinosaurfighting game★ Real wild tiger hunting game★ Control the beasts anddefend their angry attack★ Gain health by lion vs dino attackfighting★ Wild animal hunting for jungle survival & dinosaurwar★ Addictive gameplay with a jungle chaos scenario★ Realisticgraphics with astounding animationsThe dinosaur vs tiger 3D wildadventure game is great for animal simulation game lovers.Especially wild wild tiger & T-rex dinosaur simulator in thickAfrican forest. If you like the kings of jungle to be in yourcontrol and reek havoc, you are going to love this animal vs animalfighting challenge simulator.Download now Tiger vs DinosaurAdventure 3D for wild animal simulation game lovers. The firstevery Dinosaur vs tiger; wild animal games that you will love forsure. Sabertooth Tiger hunter is a real people thrilling 3D games。Beastfrom the Jurassic history threatens the entire city, manicsaber-toothed tiger in the streets to hunt down citizens, now it isthe hunter out of time, and here you have to control development tothe situation, play up your protagonist can not let thesaber-toothed tiger grab the limelight .Through a variety of gamemodes fight for survival, to complete a variety of difficult tasks,test your sniper skills to the task, and the city's residents tohelp eliminate these nasty guy.Features:- Stunning 3d graphicsenvironment- Play a virtual hunter- Kill the target you need tocomplete tasks- Lots of fun sound effects and time- Addictivegameplay realistic animation- Beautiful desertenvironmentExperience the real world 3D graphics, allowing youthinking you immersive feeling! Explore the wild jungle as a powerful tiger! This visually stunningRPG will let you develop your character and upgrade your skills tobecome the strongest cat out there. Try your skills in one of twomodes: CO-OP or PVP - everything in Online Real-Time Multiplayer.Play with your friends and people from all over the World! OnlineReal-Time Multiplayer RPG Stunning 3D graphics Beautifulenvironment Realistic animals Character development and upgradesCooperative multiplayer hunting and PVP Battle Arena modes Smoothperformance ONLINE MULTIPLAYER SIMULATOR Meet other tigers in realtime and conquer the jungles and forests! With them or against them- it’s up to you, but you’re never alone in the wilderness. Joinplayers from all around the World! PLAY WITH FRIENDS Add yourfriends and family and play together! Join and invite other playersin game to create your dream team. It’s never been easier!CHARACTER CUSTOMIZATION Create your own tiger! Choose your favorite- the Asian Tiger? White Tiger? Or maybe the rare Gold Tiger?Whichever reflects your character the best - it’s all up to you!RPG SYSTEM Decide which attributes to develop and which skills toupgrade to become the strongest out there! Choose wisely, becauseyou’re the king of your own destiny! AMAZING GRAPHICS Starting fromyour den all the way to the depths of the forest, the high-endgraphics will leave you amazed. Chase the realistic animals andenjoy the beautiful environment! VARIOUS GAME MODES Choose yourgameplay style! The hunting mode lets you cooperate with otherplayers and search for bigger prey together. If you need more, tryyourself in the PVP mode and fight against a team of enemy tigers.Be prepared for tough battles! This awesome lion vs tiger adventure 3D simulation game is thefirst and one of its kind animal simulator. You can be the lion orthe tiger and play to build reputation in the wild jungle. You cansimply attack the smaller animals like horses, deer and zebras andfeed on their flesh to gain health. You can have fights versus theaggressive animals like wolves and elephants. The face-off ofbeasts is awesome. If you are playing as the tiger, your end targetis to challenge the angry lion and if you are playing as the lion,you need to go head to head versus the tiger. But be very careful,if you have not built up your rep by increasing your level andfighting other animals, you will not stand a chance against theother beast.Control the beast in all its fury and help it surviveby chasing, attacking, fighting and eating other animals. Both theanimals are very angry and will not hold back. It will attack anyanimal that comes in its way. You can create strategies on how toattack animals with higher levels than yours in order to survive asyour survival is the number one priority. Remember, you can gettired as well, make sure to rest before challenging, fighting andattacking other animals. You can attack and feed on other animalsto regain your health. Gameplay FeaturesThe Lion Vs Tiger WildAdventure game is great for all simulation game lovers especiallyanimal simulators. If you like the kings of the jungle to be inyour control and reek havoc, you are going to love this animal vsanimal challenge simulator.Lion Vs Tiger Wild Adventure 3Dfeatures:★ Play as a lion or a tiger★ Run around the jungle as awild animal★ Control the beasts using a very responsive joystick★Gain health and increase levels by attacking animals and fightingothers for survival★ Addictive gameplay so it will keep you busyfor several hours★ Realistic graphics and animationsThis is adefinite download for all simulation lovers. The first every LionVersus Tiger game that you are sure to love. Get ready for the new wild white African tiger simulation Adventuregame! Play as a wild white tiger and get wild and hunt animals foryour prey.This is time for battle of angry wild tiger simulator inthe ultimate wild jungle.In this animal world simulator games whereyou can have all of the wild animals In this wild tiger jungle huntsimulator life is not easy as in city. Become a wild beast and playas adventurous wild tiger and hunt down the animals. Hunt theanimals In this winter camp show the world adventure of hungrywhite tiger in the jungle It is epic war and battle against thezebra, crocodile, elephant, deer, ship, fox, lion, lioness, cougar,panther, rhino, bull and bear. Experience the ultimate extreme wildlife full of the adventures of angry wild tiger. Play as wild tigersurvival simulator and survive in the wildness as long as you can.Start your own pride of wolves, fight for your life against fierceanimals like crocodile, bear and wolf and lion. You have a toughcompetition with clever fox in jungle. Play as mountain giant wildcat in the arctic jungle and move around for the fresh forestattack. Show the wilderness and anger of a wild white tiger! Searchfor food and fight for survival, Spot your territory, hunt animals,Eat, Drink, Sleep in winter Complete animal killing hunts withmultiple types of power attacks including claw, jump and bit attackfor killing the animals. In this animal hunting simulator game youwill experience the HD Graphics with realistic 3d angry wild tigersimulator in the day and night cycle of jungle. Live the as theking jungle and enjoy life of safari jungle. Increase the size ofyour pack by breeding with a female tiger to give birth to babycubs. Ensure the protection and safety of your cubs. Raise yourfamily and become the King of the Jungle. Protect the cubs fromdangerous animals that roam freely in the wilderness. In this wildwhite tiger games there are 10 adventurous mission. In each levelis fill with thrill and more exciting .In this angry wild tigersimulator you have to battle against wild animals like crocodile,lion, cougar, fox, elephant, deer, boar, buffalo, goat and someother small animals that can end your hunger. Feature of Wild WhiteTiger Game • Play as realistic wild white tiger • Real Battle ofAngry Wild Tiger Simulator • 10 amazing adventurous and thrillingmissions with hunting quest in the wild jungle • A big collectionof animals to attack like cheetah, cougar, lion, zebra, deer,lioness, jaguar, rhino, gazelle, Elephant, fox, hyena, boar andbuffalo. • A variety of wild sounds with real snow jungle game play. Angry tiger is on the loose and baffled the whole crazy town inthis super tiger city attack sim. Hunt in the streets trampled downthe fantasy city with tiger fighting games. This is biggest wildtiger revenge 2018. You must have played lion city attack or angrylion town attack games but this super tiger revenge is specialhuman warfare against the wild beast. Leap into a thrilling newadventure as a ferocious tiger and hunt ruthlessly within yoursight. 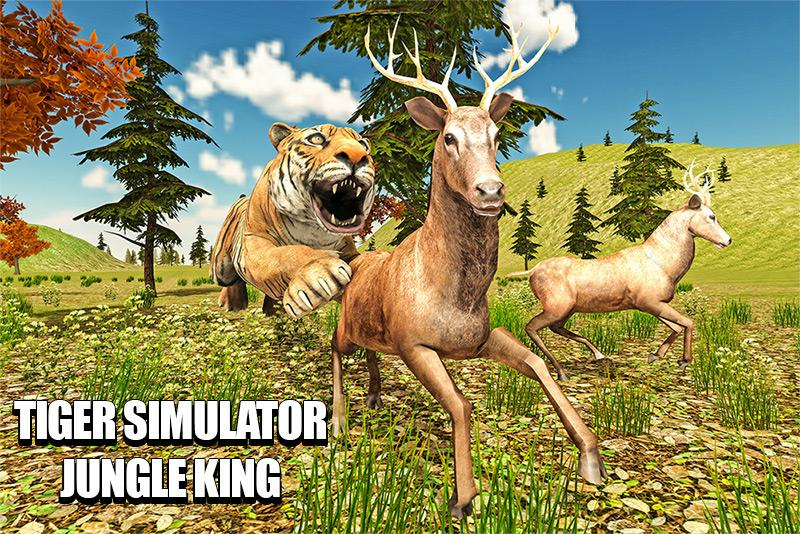 You are made to slay your victim and rule over the city intiger survival simulator. You are ready to attack your prey whetherit’s human or animal. Play this finest wild cheetah survivalsimulator with the twist of Super Tiger City Attack the story ofwild tiger attack in city. Release your ancient perception and showyour wild side! In this game! You will play and get control of afurious angry tiger that pounces and attacks its prey. After thetiger jungle survival now this wild animal will attack in city forhunger. Time to forget arctic tiger games or white tiger sim games.This city is full of dangers because angry beast tiger is ready forrevenge in this tiger fighting game. But if you feel lonely justcreate a family and want to hunt down prey for their food! Fightalone because you don’t have the clan of deadly tigers like aforest. It’s not about lion vs tiger with the wild adventure in thevast African jungle. This ultimate tiger 3d simulator is made forthe lovers who want to play tiger attack in city. ✩✩✩ Features ofAngry Tiger Attack 3D ✩✩✩ ✳ Smooth controls to make the tiger runand attack furiously. ✳ Keep eye on city police which may shoot& kill you instantly. ✳ Attack humans & their animals inthis ultimate tiger game. ✳ Realistic tiger animations &thrilling background sounds. ✳ Action-packed thrilling gameplay& HD graphics with ultimate white tiger. This wild animal tigercity attack is a complete package for those who love animalhunting, animals shooting and capturing wild animal alive andsimilar simulator games. Download Super Tiger City Attack and startthe ultimate tiger fighting simulator thrill which is unmatched inother wild tiger jungle hunt games. WHITE TIGERS ARE ENDANGERED SPICESUltimate tiger simulation, prowlthrough nature as a frightening beast! Use your sharp claws andnose, keen vision, and sensitive ears to navigate the grassy,wooded terrain, both day and night.The major habitat of whitetigers is dense jungles of avian countries.Ultimate Tiger Simulatoris awesome hunting games in lush green forest wildness. It’s anepic battle against wild animals with animal fighting games likecheetah, lion, jaguar, lioness, Rhino, gazelle, elephant and angrytiger attack as ultimate carnivore Hare, zebra, deer, buffalo andmany more animals in this wild animal simulator. Tiger fighter,wild tiger simulator 3d dominates as an African tiger and becomefurious predator in the lush green jungle. Hide yourself in unseenplaces use your animal instinct pounce back and attack ferociouslyon the animals with great wilderness in this tiger games or tigerfighter game. Play for survival and hunger in ULTIMATE TIGERSIMULATOR 3D games 2017.SPOT PREY WITH KEEN VISIONSpot prey frommiles away, plans your attack, and pounce! Explore a mesmerizingsafari environment and fight different foes like grizzly bears,crocodiles, wolf, and fox. Eat weak animals like deer, stag andzebra. They have become more powerful and are more attractive intheir specifications. But due to lack of their breeding and habitatthey are getting less in number. White tigers are not that common,they are endangered species. They need to be taken much care andadopted in a healthy environment. So Ultimate Tiger simulator is agame designed specially to teach you how to be protective aboutwhite tigers getting extinct.ESTABLISH YOUR ULTIMAGE KINDOMExperience an authentic predator experience: hunt prey and fulfillyour need for speed! Protect your clan and satiate their hunger andthirst. Have you ever imagined or want to be a real wild tiger? Nowyou finally have a chance to be an angry tiger in wild tigersimulator and tiger games.FIGHT FOR YOUR KINDOMHunt or be hunted isa part of ultimate survival of tiger fighter game. This furious andsaber tooth tiger thirsts to dominate the whole jungle. Leap into athrilling new adventure as a ferocious tiger and hunt ruthlessly.In this wild tiger jungle hunt game with tiger simulator games thebaby tiger cubs now grown into adult angry tigers. Ultimate TigerSimulator Features• Large collection of animals to attack likeCheetah, Lion, Jaguar, Lioness, Rhino, Gazelle, Elephant, Hare,zebra, deer, buffalo and many more.• 15 addictive and thrillingbloody fight and hunt missions• Stunning Safari Graphics: Awesome3D jungle environments for ultimate thrill.• Realistic tigeranimations with slow motion furious attack feature.• Completeaction packed quests: Upgrade Attack, Energy and health featuresfor better hunting skills• Advanced Hunting: Multiple types ofattacks, including Bite, Claw, Pounce and automated Power Attacks•Fight powerful and vicious bosses like elephants, hyenas, rhinosand crocodiles• Wide variety of wild animals to prey on: Deer,Sheep, Chicken, Pigs, Fish, Wolves, Moose, Crocodiles etc.•Realistic Tiger Life Simulation: Mate and birth cubs to start afamily play story mode or as free mode saber tooth tiger. • Superbtiger games with angry tiger attack animations.• Plenty ofthrilling visual Effects in latest greatest tiger simulator.It’snot like any ordinary Tiger simulator. You can customize all themembers of your family with a wide variety of colorful coats. Thereare wizards, forest nymphs, magic effects, epic enemies and even afinal battle. We've included short movie cut scenes to help see howthe story unfolds.